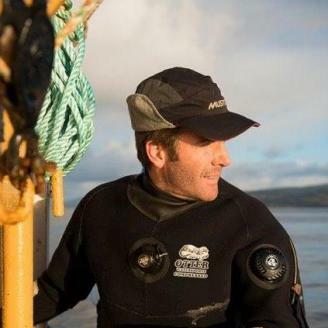 Guy Grieve is an adventurer and entrepreneur whose fight for sustainability has led him to start up a multi-award winning ethical fishing company on the Isle of Mull. He skippers the family fishing boat, Helanda, and dives for king scallops that are prized by chefs throughout Britain. Call of the Wild, My Escape to Alaska, his first book, was inspired by the year that he spent living alone in a cabin he built in the wilderness of the Interior of Alaska in 2004-05. He has gone on to present a number of television programmes as well as writing for various national publications. His latest book Sea Legs charts the year he and his family spent sailing from Venezuela to Scotland, via the Caribbean. Guy has two sons, and lives on the Isle of Mull where he dives for King Scallops. Guy’s talk will tell us the detail of his amazing journeys, with and without his family, and the philosophy that motivates his incredible travels. His talk will focus on the importance of Wilderness to humanity. That without wild places we lose our connection, which grows fainter every decade, to our planet and to meaning. Added to this we lose true wealth when we lose or fail to properly protect wild places. Yet is it possible to live and continue within a capitalist model whilst keeping wild places wild? He will examine whether we can create wealth and employment within wild places? Can wilderness and prosperity exist side by side? Who are the enemies of Wilderness? And how can they be countered? And what would a world without any true wilderness be like? Hi, thought this Lecture may be of interest http://www.wildernesslectures.com/speaker.php?id=239 ----------------------------- Guy’s talk will tell us the detail of his amazing journeys, with and without his family, and the philosophy that motivates his incredible travels. His talk will focus on the importance of Wilderness to humanity. That without wild places we lose our connection, which grows fainter every decade, to our planet and to meaning. Added to this we lose true wealth when we lose or fail to properly protect wild places. Yet is it possible to live and continue within a capitalist model whilst keeping wild places wild? He will examine whether we can create wealth and employment within wild places? Can wilderness and prosperity exist side by side? Who are the enemies of Wilderness? And how can they be countered? And what would a world without any true wilderness be like?